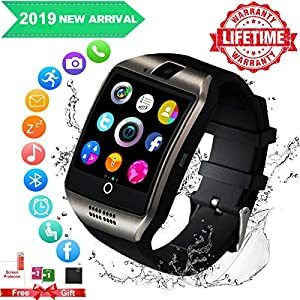 ⌚☑【Works Over Your Expectation】: Smart watches- easy to connect to your smartphones and speaker phone works seemlessly.The voice of bluetooth smart watch and smartwatch android is clear and loud. 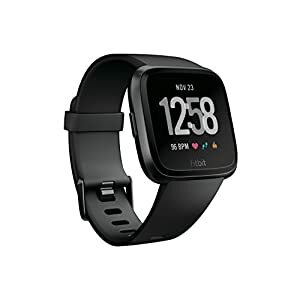 Listen to music and make calls from your watch Freely. 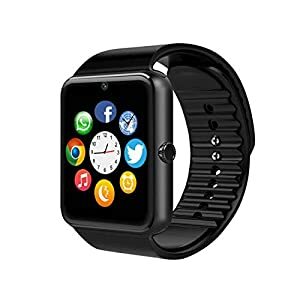 Luckymore android smart watch is Absolutely a good gifts for your parents boyfriends gir friends husbands wives etc. 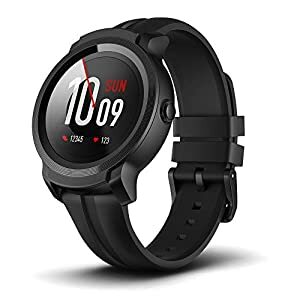 【Multifunctional Smart Watch】Dial via watch sim card or Bluetooth optional, pedometer, calories calculation, sedentary remind, sleep monitoring, remote photos, music playing, alarm clock, two-way anti lost, voice recorder, muti-timezone, muti-language, daylight saving time and notification push including Facebook, twitter, email, calls, texts etc. 【Comfortable Wearing Mode】Stainless steel surface, precision laminating process. Nano TPU85 material strap, anti-sweat matte surface treatment, ergonomic convex design and soft strap, which make wearing more comfortable. Life water resistant, the smart watch surface can resist rainwater impact when you are in outdoor. 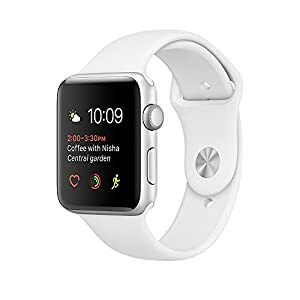 【Long-Lasting Battery Life】After fully charge, the smart watch can use 2 days. An extra free battery is offered. 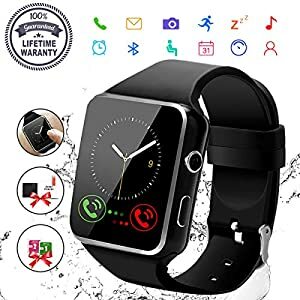 Never worry about your smart watch to be out of battery. 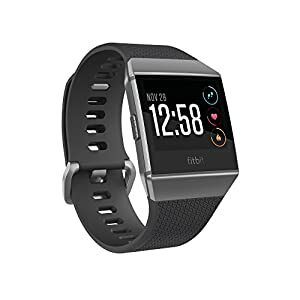 ♛ New Upgrade Smart Watch – Stainless Steel Wire Drawing Surface, Precision laminating process, Nano TPU85 material strap, anti-sweat matte surface treatment, ergonomic convex design and soft strap which make wearing more comfortable. Don’t worry about the after-sale problems, we provide Lifetime Warranty Service without reasons. ♛ Two Working Model – Bluetooth model: Connect the smart wrist watch to your phone via bluetooth, then you can make phone call, including answering and dial-up, view and reply text messages, view app notifications and so on; SIM card model: If you install a GSM 2G/2.5G Network SIM Card into the smart watch, you can make phone call directly from the smart watch, including answering and dial-up, send/reply messages,take pictures, play music etc..
♛ Sync Function – Just connect the smart watch with your phone via Bluetooth, then download and install the APP, so you can read Whatsapp,Twitter,Facebook and other application push messages, view and reply text messages, the time and date will be automatically synchronized. 【Watch Phone】 Install an unlocked Micro sim card after you open the back cover to make Phone calls, GSM bands 850/900/1800/1900MHz. 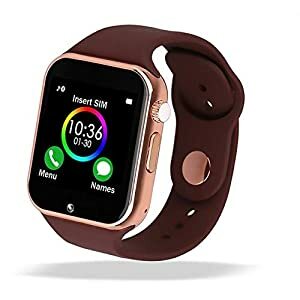 【Bluetooth Phone Calling】If you don’t have a micro sim card, you can also make phone calls after you connect your watch to your Android smart phone via Bluetooth. 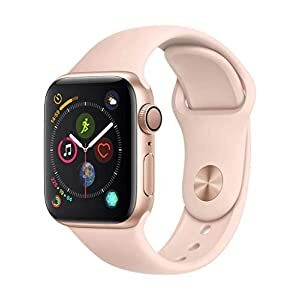 【HD display】High sensitive capacitive touch screen, perfect wearable technology sensitive screen allows you cooperating with your phone smoothly. 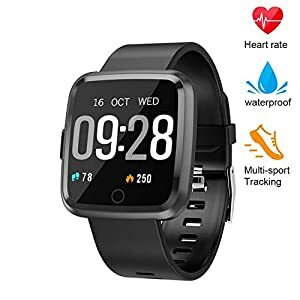 ⌚Multi-Function: This smart watch has many functions: Dial, Message, Bluetooth, Remote Cameras, Alarm Clock, Steps Counting, Sleep Monitor, Sedentary Remind, Anti-lost, Audio Player, Camera, Pictures, Recorder, Calendar, Calculator, Browser, Twitter, Facebook and so on. 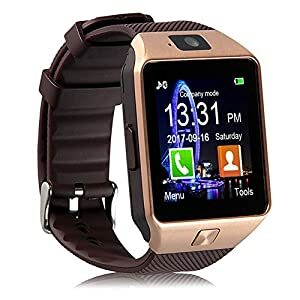 ⌚Two Working Modes: Use as an phone: If you install a GSM micro sim card(2G) and a micro SD card(up to 32G) into the smart watch, you can make phone call directly from the smart watch, including answering and dial-up etc; Bluetooth smart watch: Without SIM card, you can connect watch with phone by Bluetooth, then you can make phone call, including answering and dial-up. 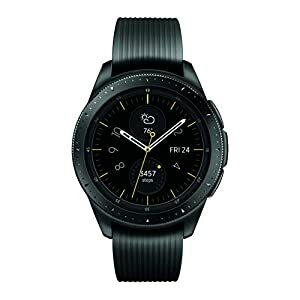 ⌚Synchro Function: Just scan QR code, download the BT APP, install and use the Syne software, then you can read SMS, view and reply text messages by the watch. The time and date, phone book, phone calling, musics playing and so on will be automatically synchronized. (APP does not support iPhone).